THIS IS A GUEST BLOG from my friend the alliterative punster, Douglas Groves. 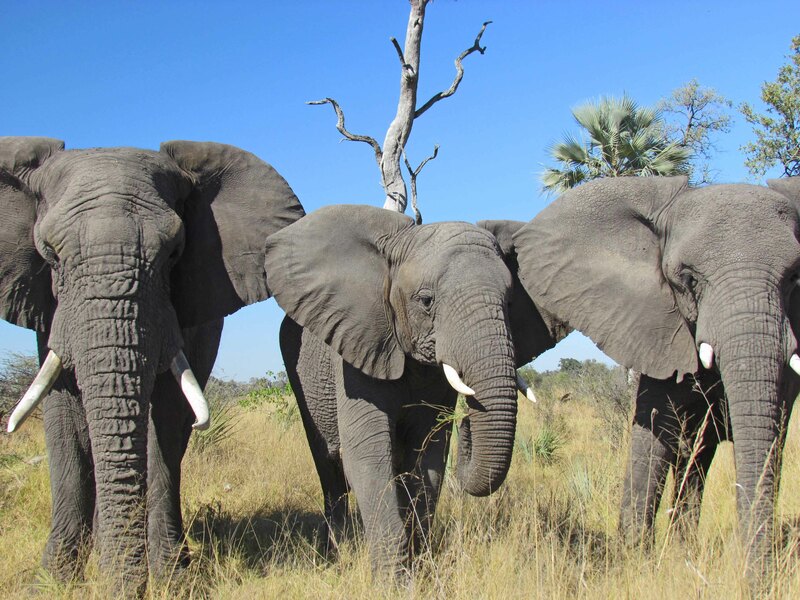 Doug and Sandi Groves live in Botswana’s Okavango Delta with their three elephants: Jabu, Morula and Thembi. (You may have already noticed that I write about them in this blog and post pictures of them from time to time.) Be sure to check the elephant’s Facebook page. 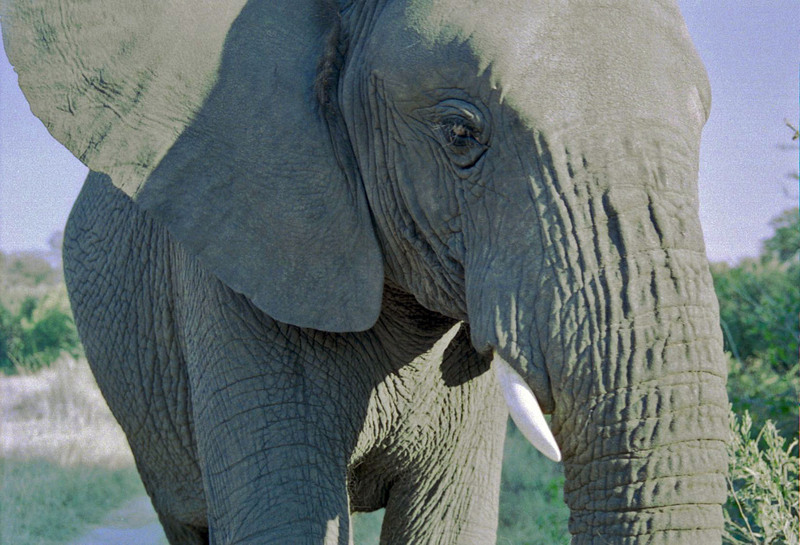 Humans and elephants have evolved the largest and most complex brains of all land animals. Social brains, emotional brains, brains that change, connect, cooperate, compare and compete. Our convoluted cortex and huge hippocampus help us to perceive, process and pass information down through the generations in a similar way. 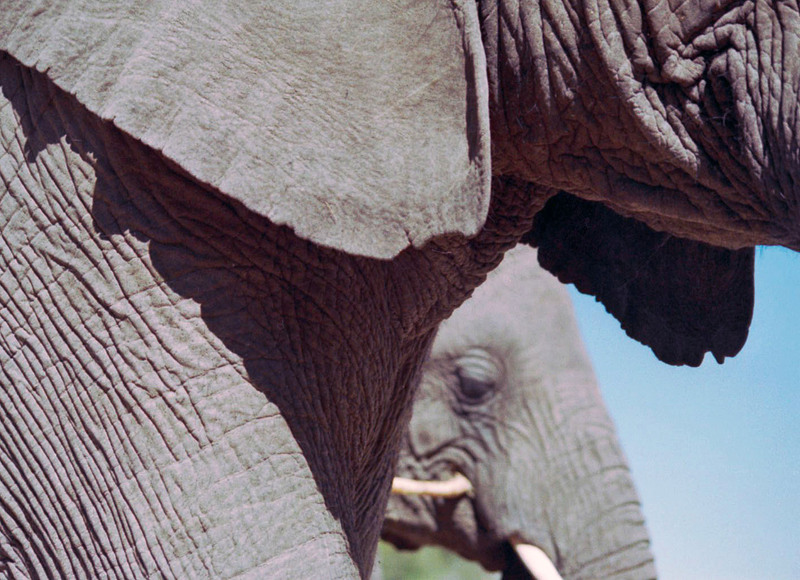 Tender, strong, silly and smart, elephants tug at our emotions, and, perhaps, we at theirs. We become self and socially aware as well as aware of the world around us, through our brains. And the Earth, it has been said, has now become self aware through our collective intelligence. Our brains make us resourceful, dynamic and adaptable but they can also get us in to trouble. Common spawn of the same ancient African alchemy, we go way back together, our deep organic roots entwine through steamy primordial millennia. Emerging from a marvelous melee of merrily mutating mammals, man and elephant, the two terrestrial titans began lording over the lesser lot. Nosey and manipulative in equal measure, our tribes and herds exploded out of Africa on an extraordinary evolutionary extravaganza, becoming very prominent features of the fauna far and wide. High and mighty, yet down to earth, elephants embody the gentle soul, the sacred heart, the wonderful wild wisdom and the absolutely awesome and pivotal power of our almighty matriarch herself… Mother Nature. From aberrant ape and rag tag tribes to a great globalized superorganism, Man has drifted apart from the magic of nature and his great grey friends. Our biological evolution has been usurped by lightning fast cultural and technological advances. Ignoring planetary limitations we’ve become a geophysical force, reshaping the face of the planet and impacting the future of life. We’ve created creeping confluent conurbia, fetid factory farms and monstrous mechanized monocultures, mining and megopoi! We’ve altered atoms and modified molecules, tinkering with the very stuff of life! 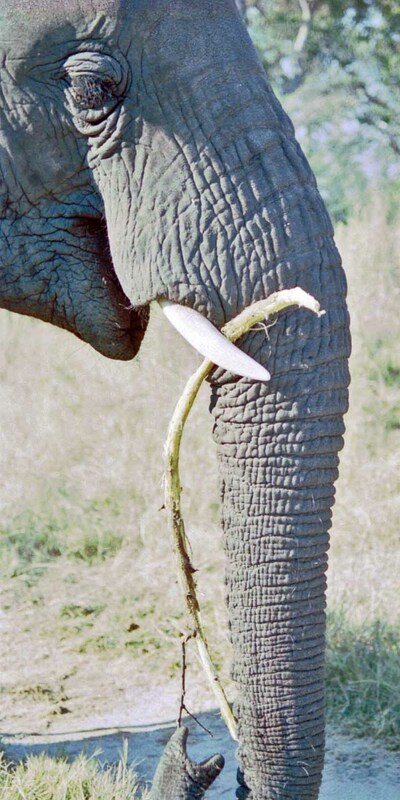 Unlike our rapacious rat race, elephants utilize only renewable resources and the byproducts of their consumption become a biological bonanza. Ecologists call them a super keystone species and ecosystem engineer. 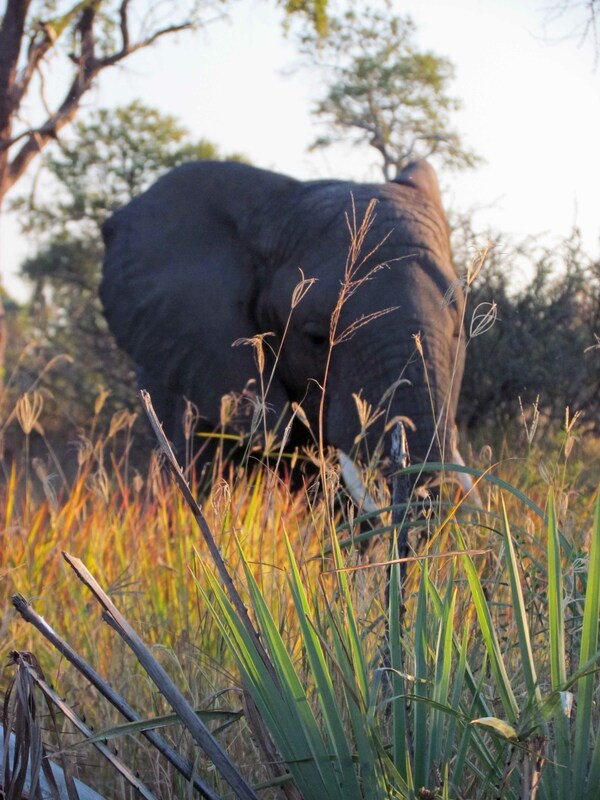 When we conserve areas large enough for elephants we conserve whole ecosystems. Conservationists know that their role as a charismatic flagship species is essential in preserving wild habitat. Today, for the most part, we live walled off from nature. Gizmos and gadgets, distractions and devices dominate our lives. Isolated from the natural world we rely on luxuries rather than relationships for a sense of fulfillment. Much of the information we receive is carefully controlled and expertly edited, cherry picked, censored. 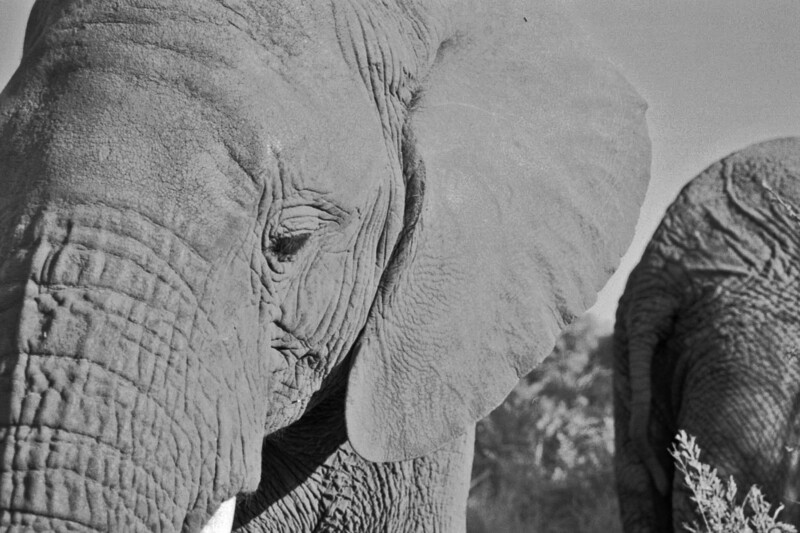 In this era of skyscrapers and screens when virtual reality has invaded our dreams, we desperately need something real, something big to believe in, we need elephants now more than ever before. We are currently at a crossroads. We can stay on the same path, a business as usual course, in which case we will destroy our planetary life support systems or we can reconnect with our elemental foundations, get back in touch with nature and learn to live with ecological integrity. Grey matters because things change as energy flows through us. Our trajectory through time is limited. As we become more mature we often start examining existential questions and issues. Why are we here, how can we help and will we leave a legacy worth living? Hopefully, as we grow older we will also become bolder in making choices that will benefit future generations. A continuing series of elephant photographs. 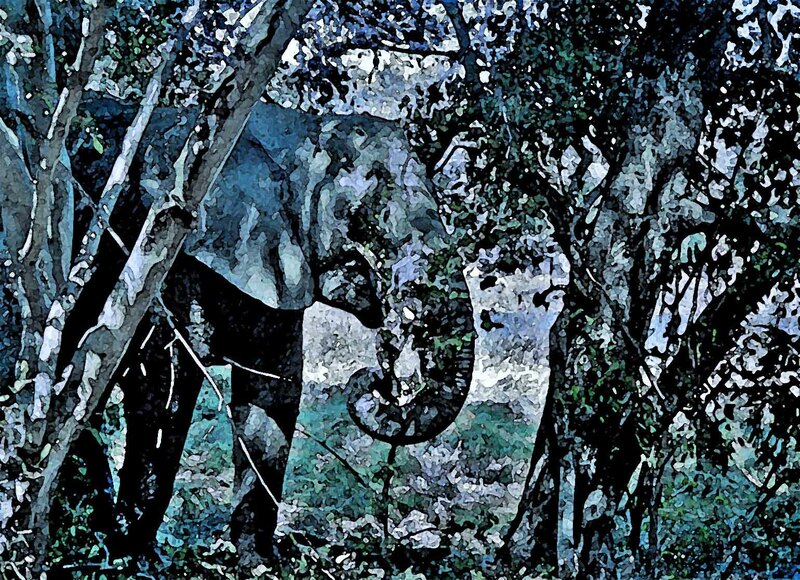 Watercolor of Thembi, photoshopped. Loved all the original blues and thought it might look great as a watercolor. Chief’s Island, Moremi Game Reserve, Botswana.